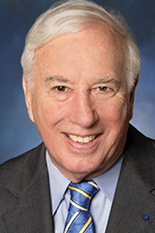 Glenn L. Martin Institute Professor of Engineering and former University of Maryland (UMD) President, C. D. Mote, Jr., has been appointed a member of the Chinese Academy of Engineering (CAE). He is one of eight foreign members named this year, a list which included five Americans. Mote currently serves as the President of the National Academy of Engineering (NAE), while still holding a professorship with the UMD Department of Mechanical Engineering. He was elected to the NAE in 1988 for his analysis of the mechanics of complex dynamic systems, which provided results of great practical importance in vibrations and biomechanics. He served as the President of University of Maryland from 1998-2010, and during this time, he launched the first Confucius Institute in the United States, which is located on the UMD campus. He has received numerous awards and honors throughout his career, including the NAE Founders Award, the Federal Republic of Germany Humboldt Prize and the American Society of Mechanical Engineers (ASME) Medal, the highest honor in the field of mechanical engineering. He is an Honorary Fellow of the American Society of Mechanical Engineers, and Fellow of the American Academy of Arts and Sciences, the American Academy of Mechanics, the Acoustical Society of America and the American Association for the Advancement of Science. He holds three honorary doctorates and two honorary professorships, and over the course of his career, he has authored or co-authored more than 300 publications and mentored 58 Ph.D. students. The CAE is a national and independent organization composed of elected members with the highest honor in the community of engineering and technological sciences in China. According to its mission statement, the academy’s goal is to initiate and conduct strategic studies, provide consultancy services for decision-making of nation’s key issues in engineering and technological sciences, and promote the development of the undertaking of engineering in China and devote itself to the benefit and welfare of the society.